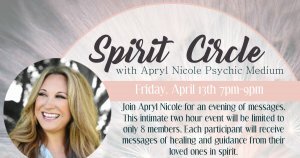 Join Apryl Nicole for an evening of messages. This intimate two-hour event will be limited to only 8 members. Each participant will receive messages of healing and guidance from their loved ones in spirit. Wine & refreshments will be served.